Public transport authority and VicRoads join forces on Punt Road widening plans. January 2, 2016 Melbourne 'Age'. Punt Road would be widened to six lanes under options put forward by VicRoads. Photo: Darrian Traynor The state's public transport authority has backed a push by VicRoads to widen Punt Road at key choke points, and eventually to consider demolishing homes to turn the heavily congested arterial road into a six-lane highway. "To keep us on side, Labor said 'We will order this inquiry because it's not right,'" said Andrew Carrasco, a member of Drop Punt, the resident group lobbying to get the overlay removed. "Now they've just turned about face, and said in fact 'We should build a highway.' It's a real betrayal." This has to offer benefits to bus routes too. If you're driving on Punt Road today, there is a new rule to pay attention to. It's the first day of the permanent clearways. We'll have a report later this morning on just how well they worked - for now, here's Clay Lucas's original story. Punt Road will be turned into a permanent clearway next month, stopping single parked cars clogging up one of the city's busiest arterial roads. The 24 h clearways on Punt Road will operate from August 29 seven days a week. Currently, clearways operate on weekdays only, along both the eastern and western sides between 6.30-9.30am and 3.30-6.30pm. 8.29 Today may mark the day Punt Road lost its rhyming nickname. The busy arterial road, known for causing Melburnians headaches, has permanent 24-hour clearways as of this morning. A VicRoads spokesman said early observations showed traffic was moving quicker in both directions along the road. "It's looking pretty good right now," he said, just after 8am. "It's a bit more free flowing." Previously, the clearways operated on weekdays only, along both the eastern and western sides between 6.30-9.30am and 3.30-6.30pm. Those ignoring the new rules will face a $155 fine and $334 to collect their cars. Punt Road looking south towards South Yarra. Photo: Darrian Traynor. If they had put a bus lane in, then yes there would be benefits. Otherwise any short-term relief will quickly be filled up by more car traffic. philm wrote: If they had put a bus lane in, then yes there would be benefits. Otherwise any short-term relief will quickly be filled up by more car traffic. Mind telling me where they would put a bus lane in?. And how would that help? Sorry I missed this. Basically for the extra lane capacity that they have created, turn at least one direction into a part-time or full-time bus lane. Then you could run more buses along that corridor and help to alleviate traffic. 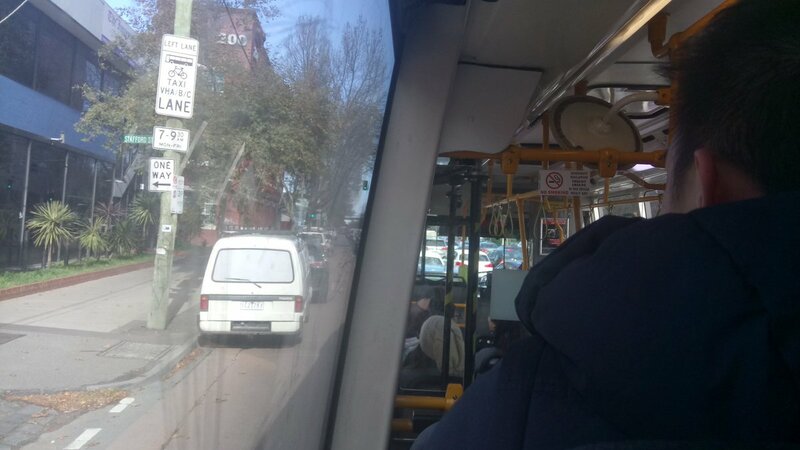 The problem is that the section from the Yarra River to St Kilda Rd is two lanes each way, there is only the 246 that operates along that section, and the best frequency is a short burst of every 7 minutes between 7am and 7.30am southbound. Most of the rest of the time the frequency is around every 10 minutes. There is no way anyone is likely to agree to a halving of the road capacity, having just kicked out parked cars off peak when the bus frequencies are every 10 minutes. Politically it would be a loser, with people fuming at a seemingly empty bus lane, and with a bus of at best 70 people every 10 minutes it would probably be the correct decision to leave it as a general traffic lane as there would be a capacity decrease, even assuming every bus were full and standing at the time of operation of the bus lane. 170803Su Melbourne 'Herald Sun' - Hoddle St 24/7 clearway. Good to hear (again). The media release does not mention a northbound bus lane though. Hopefully this is an accidental omission. Thank goodness. I had cause to use the DART buses last weekend on both Saturday and Sunday, changing in Hoddle St on both occasions. Was ridiculous that the bus lane is there used as parking, meaning buses crawl along darting in and out of the left hand traffic lane as they service each stop. Thankfully motorists were pretty good about letting buses in, but it was pretty inefficient. FWIW, weekend services along the freeway were full and standing on each service I used on both 905 and 906, as well as the 246. The bus lane on the weekend would be used by 11 buses an hour (2x905, 2x906, 3x907 and 4x246). With sufficient bus priority, it might improve patronage just enough to warrant a better frequency and produce a virtuous spiral of service improvement, further justifying a 24/7 bus lane. krustyklo wrote: Thank goodness. I had cause to use the DART buses last weekend on both Saturday and Sunday, changing in Hoddle St on both occasions. Was ridiculous that the bus lane is there used as parking, meaning buses crawl along darting in and out of the left hand traffic lane as they service each stop. Thankfully motorists were pretty good about letting buses in, but it was pretty inefficient. FWIW, weekend services along the freeway were full and standing on each service I used on both 905 and 906, as well as the 246. The bus lane on the weekend would be used by 11 buses an hour (2x905, 2x906, 3x907 and 4x246). With sufficient bus priority, it might improve patronage just enough to warrant a better frequency and produce a virtuous spiral of service improvement, further justifying a 24/7 bus lane. It might worth upgrading 905 & 906 to 20 minutes on weekends like did 907 & 908 last year. While furthermore it may be worth 908 going into City reduce pressure on 907. Swan St gains too, helping trams. krustyklo wrote: The bus lane on the weekend would be used by 11 buses an hour (2x905, 2x906, 3x907 and 4x246). With sufficient bus priority, it might improve patronage just enough to warrant a better frequency and produce a virtuous spiral of service improvement, further justifying a 24/7 bus lane. Not forgetting the 302 & 304 Belmore Rd services, which makes the total 15 buses an hour on Saturdays. I can't comment on weekend 907 services but I was actually somewhat surprised how busy the 905 and 906 were on the weekend. Once we entered the freeway, in all instances on both days there were all seats taken and people standing in the aisles, including most of the way towards the back. This was both in the middle of the day heading to the city, as well as around 5pm heading back (we'd gone to AMRA at Caulfield on the Saturday and the football at Etihad on Sunday). To be honest, I suspect more frequent services would attract enough extra patronage and spread the existing patronage to still provide full buses without having people standing towards the back (which I suspect is not overly safe having nearly fallen down the stairs before in similar situations with sudden stops). It will be interesting to see the Census data on travel to work from Manningham when it is released in October to compare it to the 4,279 out of 53,191 people who travelled by bus in the 2011 census (8%) when DART had just started the previous October. For comparison, the previous figure was 3,155 out of 52,751 in the 2006 census (6%). Even 20 minutes in a city the size of Melbourne at weekends is a joke. Certainly increasing the hours (in each direction) that the 908 runs through to the city on both weekdays and weekends would decrease overcrowding, particularly on the 905. Currently the 905 is a better option for some compared to catching a 908 and wasting time at the Park and Ride. After 33 years of commuting by bus, I now have a Seniors Myki and two more hours a day not stuck in Victoria parade on a Transdev bus. In the media stories it also mentioned about increasing the green light time for through Hoddle St traffic. Already in the weekday am peak there can be a queue of buses waiting to turn right into Victoria Parade so presumably the southbound bus lane will become a parking lane for queued buses. The left turn in the evening peak shouldn't be the same problem if the bus lane is made continuous from Victoria Parade into Hoddle Street but is that asking too much of VicRoads in their battle against local councils? There aren't any vacant shops on nearby Bridge Rd they can move to? One of Australia's longest-running fetish leather stores is rejoicing after an Andrews government plan to replace parking in front of its business with 24-hour bus lanes was watered down. Eagle Leather and other businesses in a small section of Hoddle Street near Collingwood Town Hall warned this week they were on a "fast lane to bankruptcy" if Roads Minister Luke Donnellan pushed through the permanent clearways. The 24-hour clearways were to traverse all of Hoddle Street in Collingwood, from the Eastern Freeway to CityLink and the Yarra River. The government has already put permanent clearways on both sides of Punt Road, from the Yarra to St Kilda Junction. Mr Donnellan announced on Wednesday that Hoddle Street would face an unprecedented near-total eight-day closure in both directions from the Eastern Freeway to Victoria Parade. Construction crews will tear up and re-lay Hoddle Street from January 7 to 14, capitalising on the quieter traffic – 15 per cent lower at that time of year. Footpaths will remain open, as will one lane of the road for local traffic and buses. But the clearways that were to take in all of Hoddle Street once the works were complete will now only apply on weekday mornings near Eagle Leather and its neighbours, between 6-10am. Clearways will not be applied on that side of the road in the afternoon. "I am so happy we've been listened to," said Brendan Jupp, co-owner of Eagle Leather. The government's reprieve for the businesses – which say they rely on parking out front for a steady stream of customers – came after Yarra Council campaigned with them to convince the government to back down. Mr Jupp said the section of Hoddle Street where his business is located had become a gay, lesbian and queer hotspot in Melbourne, with other destinations like tattoo and piercing business Piercing HQ and The Laird Hotel also nearby. He said the parking ban would have lashed his store and others, in return for only slightly quicker bus rides. To prove their case that clearways were only needed in the morning peak hour, the retailers took five Uber trips along Hoddle Street from Johnston to Victoria streets over five consecutive weekdays. The trips, between 5-6.30pm when there were no clearways in place, took an average of two minutes and 42 seconds. "Even on a Friday at peak time, the slowest trip was still only 3 minutes and 44 seconds, which proves our point that a 24-hour bus-only lane is just not required," Mr Jupp said. Bella van Nes, of Piercing HQ, said at least half of her customers relied on on-street parking. "We do major procedures in our business, so people having close access to their vehicles is necessary," she said. Yarra Council gathered almost 600 signatures opposing the plan, and said the need for 24/7 clearways was "not clear." Mr Donnellan said the government had made a tough decision on the eight-day shutdown for Hoddle Street, in the pursuit of long-term gain. "Shutting down a section of Hoddle Street isn't a decision we take lightly – but it'll allow construction crews to get the best start to this project during school holidays and spare drivers from three months of ongoing closures."